“About three months ago, two freshly graduated St. Thomas alums were running a very small-scale decorative ice carving business. Then one of its founders sat in the right seat, on the right plane, next to the right person, and everything changed. Ice carving used to be a craftsman’s art performed with hand tools. MN Ice Sculptures has turned it into a computer-navigated machining process. It turns out Harrell was seated next to 10-year Viking’s long snapper Cullen Loeffler, who was headed home and was intrigued by Harrell’s 1-year-old business. “So I mentioned that my business partner was interested in selling his half of the company,” Harrell recalls. 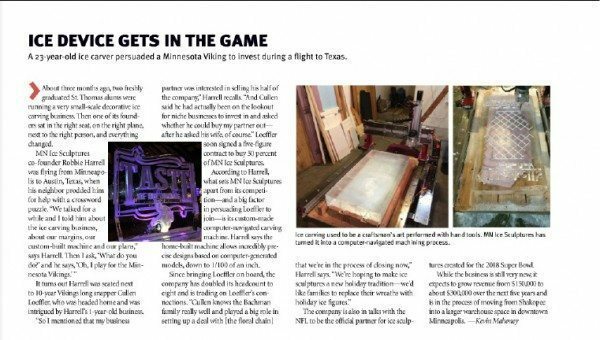 “And Cullen said he had actually been on the lookout for niche businesses to invest in and asked whether he could buy my partner out—after he asked his wife, of course.” Loeffler soon signed a five-figure contract to buy 50 percent of MN Ice Sculptures. According to Harrell, what sets MN Ice Sculptures apart from its competition—and a big factor in persuading Loeffler to join—is its custom-made computer-navigated carving machine. Harrell says the home-built machine allows incredibly precise designs based on computer-generated models, down to 1/100 of an inch. The company is also in talks with the NFL to be the official partner for ice sculptures created for the 2018 Super Bowl.